You will get 2 decals (1 Pair). SKU: RD01. Categories: Various Small Decals (All), WIN & Redline. Tags: 1979, 1980, 1981, 1982, 1983, 1984, Apollo, E.T., ET, Handlebar decal, KE-1, Kuwahara, KYZ, KZ, KZ-1, KZ-2, Redline, Redline Pro, Redline V-Bar, Stu Thompson. New Factory Correct REDLINE Approved V-Bar Decal Sticker that came stock on Redline V-Bar Handlebars in the 1980’s. These were found on the Kuwahara KZ, KE-1, models, and more. Rare and hardly ever found for sale. These are High Quality silkscreened decals. You get what you pay for! Other reproductions out there are NOT accurate! These are the finest reproductions you will find for sale. 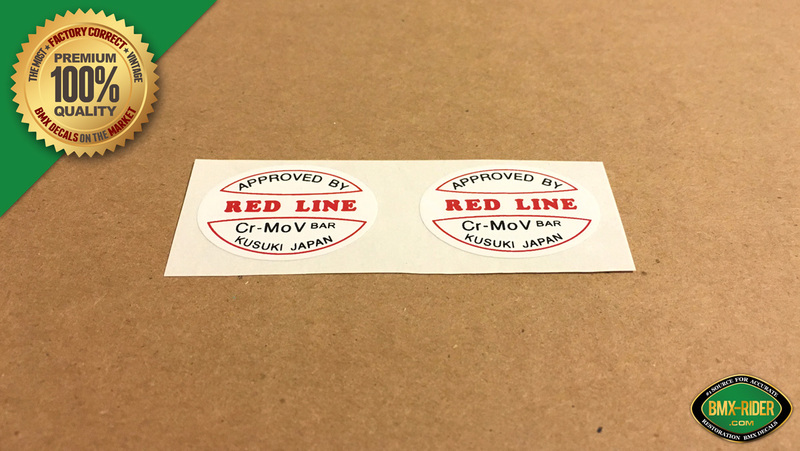 These decals are the most factory correct Redline Approved V-Bar decals you will ever find – Assuming that you can even find a Redline Approved V-Bar decal for sale. These decals have been Silkscreened and die cut just like the originals back in the 1980’s… NOT digitally printed on either a Gerber or Ink Jet printer like most reproduction decals out there.